The Dark Knight of Seattle has been arrested after attempting to allegedly stab a bouncer with a blade attached to a homemade spear and reportedly throwing an actual bat-shaped blade at police officers. Officers were called to the Capitol Hill Bar Monday afternoon following reports that a man was threatening workers with a knife attached to a wooden pole. 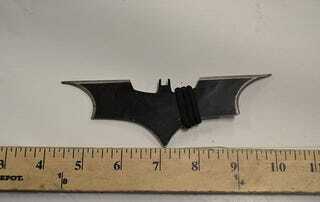 When the cops arrived, the 23-year old suspect threw a metal object which was later discovered to be a bat-shaped blade embedded in the front of the patrol SUV. The suspect was caught and charged with felony assault with additional charges yet to be filed, according to The Seattle Times. The last I checked, silent guardians and watchful protectors weren’t actually supposed to shank employees of a bar. Not a hero, indeed. So far the man’s motives are unclear, but he wont be dishing out any vigilante justice from behind bars. Sadly Seattle’s Batman instead saw himself become the villain. Whatever Seattle needed him to be was not a Batarang-throwing attempted murderer.